Nakita, the Stonekeeper's daughter, lives in a remote village high on Eagle Rock. 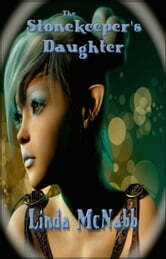 Her father guards four sacred stones and conducts mysterious experiments for his master. Cut off from the outside world, Nakita longs to see what lies below the mountain. She hears the whispering voices in the stones but when she gives in to her curiosity and picks up one of them her life changes forever. Then her village is discovered by two strangers she is forced to flee into the valley below where she discovers the world is much stranger than she ever imagined.